Hello there everyone! Happy Black Friday?! I really wish Black Friday was on Black Friday anyone else? Don't know if you all saw but I did add some sales to the post I put together the other day so you may want to check that out here. 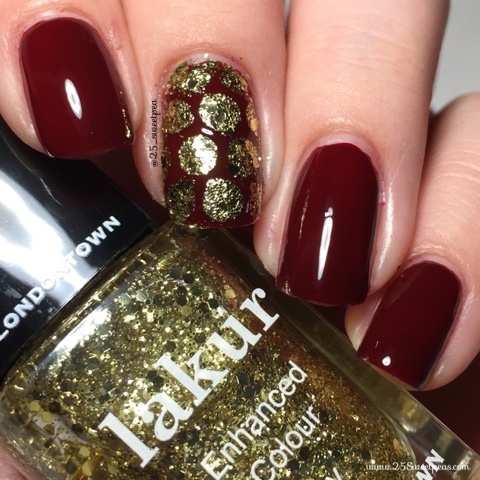 Today for y'all I will be reviewing some Londontown Lakur polishes. :) So let's get to it! First up today is my swatch of Lady Luck which is a very very deep burgundy/Marsala. It's a lovely color actually! This was 2 easy coats. The formula was very even on each coat! Only reason I did 2 coats was to build up to the color in the bottle and it's lovely! It dried very shiny and just over all very nice!! Next up is Britannia which is a golden glitter topper so I actually sponged it on top of a Twinkled T vinyl. I have a full tutorial up on YouTube for this look and I will have that linked closer to the end of the post! :) Even though it is a topper one coat did give nice and even glitter as well so I will have to show you that in another look soon! After everything I topped it off with their Kur Protective top coat. So far I am liking it. 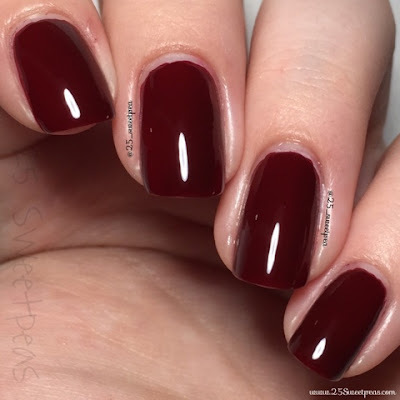 Application wise it reminds me a bit of Essie's Gel Shine Top coat but this one is actually easier to work with so that is good in my opinion! Next up is the tutorial! Here are some tips for using vinyls! Well I hope you all enjoyed this post and hopefully the tutorial as well! Have a wonderful day guys, talk to y'all soon! 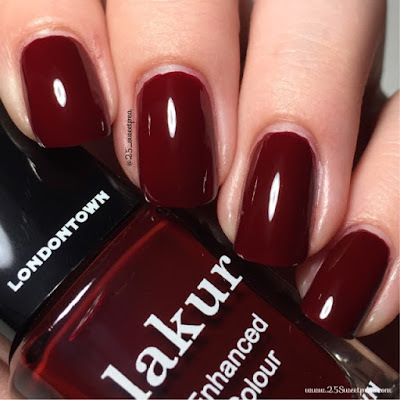 To find this polish near you or order online click HERE.